Wet scrubbers are used in many industrial processes to remove potentially harmful and polluting gas emissions. These gases form as a result of combustion in utility and industrial process plants. By-products and waste gases that can be removed during scrubbing can include hydrochloric acid (HCl), hydrogen sulfide (H2S), chlorine (Cl2), and sulfur dioxide (SO2). Wet scrubbers operate by spraying the incoming gas stream with a scrubbing solution containing a neutralizing chemical, which destroys the harmful gas. This process is illustrated above. The effectiveness of the scrubbing solution in removal of harmful gases depends on the concentration of the scrubbing chemical, which is continuously depleted throughout the process. Scrubbing chemical concentration must be maintained to ensure effectiveness of the scrubber. Continuous Scrubbing: Continuous replenishment and blowdown. Scrubber solution composition at any time will depend upon how it is being controlled, the scrubbing chemical, and gases being scrubbed. 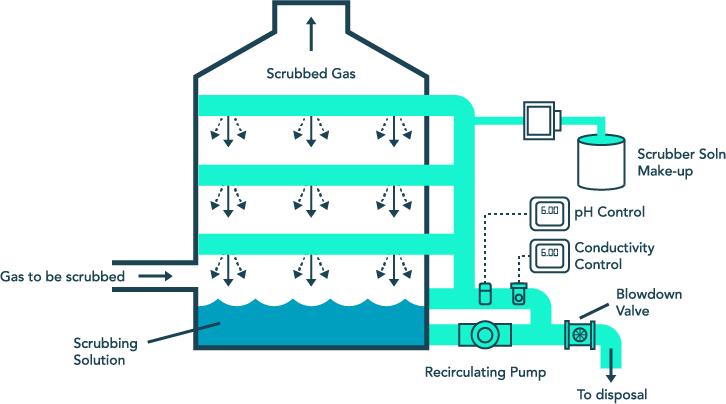 Batch Scrubbing: Starts with an initially high concentration of scrubbing chemical that is allowed to reach near depletion, followed by blowdown and replenishment by fresh, full strength scrubber solution. pH control is often the choice for scrubbers using continuous blowdown and replenishment. Acidic gas scrubbing, such as hydrochloric acid (HCl), is controlled by maintaining an excess concentration of a basic scrubbing chemical, such as caustic (NaOH) or lime (Ca(OH)2). pH is specific to hydrogen ion (H+) concentration, which is related to the concentration of the basic scrubbing chemical. This specificity allows pH to be used to control scrubbing with minimal effects from scrubber by-products (unlike conductivity, which is nonspecific and will be influenced by by-products). If the scrubber uses strong caustic (10-15% NaOH), pH control is not recommended because the exposure of the pH glass to high concentration of caustic will attack the pH glass, thus destroying the electrode. The pH response curve follows a strong acid/base titration curve, which results in a reading that only drops back on-scale near a point of complete exhaustion of the caustic, followed by a sudden drop at the exhaustion point. ORP (Oxidation Reduction Potential) measurement may also be used in conjunction with pH measurement if the scrubbing reaction involves an oxidation or reduction change. ORP monitoring can only be used to determine the complete exhaustion of a particular chemical and is not recommended as a means to determine concentration of scrubbing solution or by-products. Conductivity is best suited to measure scrubber solution concentration in batch scrubbers. As mentioned previously, conductivity is nonspecific and will respond to both conductive scrubbing chemicals and by-products. As the scrubbing chemical is depleted, its contribution to the scrubber solution conductivity will decrease. At the same time that the chemical concentration is being depleted, the by-products are building up and their contribution to the total conductivity is increasing. If a measurable decrease in conductivity is detected as the scrubbing solution is depleted, then the scrubbing chemical concentration can be measured. One example of this is batch scrubbing of chlorine gas (Cl2) using strong caustic (10-15% NaOH). If more than one gas is being scrubbed, difficulties can arise. Depending on the relative proportions of the gases, the by-products formed will differ, leading to variations in the conductivity background. Deriving concentration from conductivity can be difficult, although a conductivity measurement may still provide an alarm point to alert the operator to check a grab sample. Although conductivity is used most often for control in batch scrubbers, it can also be used to initiate blowdown to prevent a build up of dissolved solids in continuous replacement scrubbers. Most pH sensors tend to coat in scrubbing applications, especially in applications that use lime (Ca(OH)2) as the scrubbing chemical. To minimize coating effects, make sure that the sensor is mounted in a high flow area (in-line > 3 ft/sec velocity is suggested). The use of flat-surface, self-cleaning pH sensors & ORP sensors or differential pH & ORP electrodes is recommended to reduce the required cleaning frequency and save time. It is also recommended to avoid using pH control for scrubbers involving strong caustic (10-15% NaOH) scrubbing solutions. This can damage the pH glass and shorten sensor life. Choose the construction material of pH electrodes based on the chemicals being used and any possible by-products (such as CPVC or PVDF). Toroidal conductivity sensors and instruments should be used for scrubber control because they are highly resistant to fouling and require minimal maintenance, unlike traditional contacting sensors. They are also recommended due to the high conductance of many of these scrubbing solutions and by-products. It is important to gather information about the scrubber application prior to selecting sensors. Some typical gases and corresponding scrubber solutions and measurements are shown below. Electrode installation depends on the piping system dimensions. For piping with 2″ diameter, a wet-tap installation is offered. This allows the user to directly insert and retract the electrode into the line to take advantage of the turbulent flow or position the electrode near the pipe wall. We suggest installing a by-pass line with isolation valves so that the scrubber does not need to be stopped to remove or maintain the electrode. No tools are required for electrode maintenance. Some scrubber configurations are best suited for monitoring the scrubbing solution concentrations in a tank or sump. Submersible sensor configurations using convertible mounting threads make this a simple installation with inexpensive CPVC piping coupled to process sensors. A pH transmitter may be used to condition the sensor signal so that the data can be received by a PLC or SCADA system. Alternatively, a pH controller can be used to set high / low points and directly operate pumps or alarms based on sensor data. Our transmitter and controller buyer’s guide can help you select the right instrument for your monitoring system.